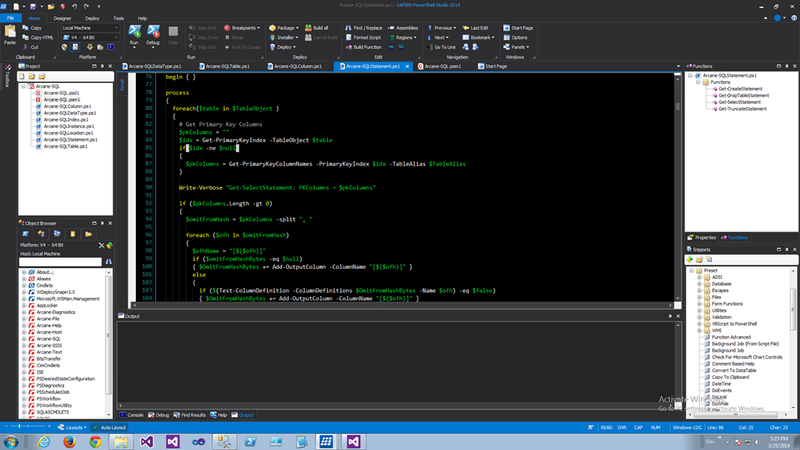 Earlier in the week (post) I started this series on SAPIEN PowerShell Studio 2014 discussing customization. How appropriate to wrap up returning to that same topic. The original version I downloaded was 4.1.47. Late last night I found out a new version has already been released, 4.1.49. 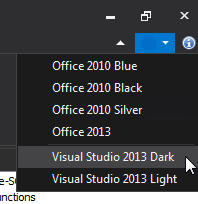 I downloaded it and to my pleasure found two more options for color themes, Visual Studio 2013 Dark and Visual Studio 2013 Light. Note that the colors of the editor are not set with this selection, only the backgrounds for things like the menus, title bar, borders, etc. If you want the nifty dark settings in the editor you’ll still need to set them yourself, or use the XML data I listed at the bottom of the already mentioned first post in the series. You may be wondering how I found out about the update with these new features. Well, SAPIEN has a particularly nice set of forums, located at http://sapien.com/forums/. As you might expect there are forums for all of their products, but you will also find forums for the various scripting languages. In here you can ask generic questions not directly related to any of their products. Within an hour a support person named David had answered my questions, one of which as you’ll see was on the color themes. Now, what particularly impressed me was four days later David remembered my forum post, and placed a follow up post letting me know about the update with the new dark color theme. Now that is some outstanding customer service, big kudos to David (whoever you are) for the follow up.